Muslim Coalition of Connecticut shelter serve - September 5, 2015 at Mercy shelter - thank you to all our volunteers! The Congregational Church in South Glastonbury's "Getting to Know Your Muslim Neighbors" program promises to be an excellent interfaith learning opportunity. Rev. Richard Allen and South Church have been on the vanguard of interfaith collaborations for years. I've seen first hand the good works of South Church and the Muslim Coalition of Connecticut through my work with them at Hartford Area Habitat for Humanity. Please read Hartford Courant reporter Peter Marteka's March 31, 2016 article titled Church To Host Series On Islam, which I printed in its entirety below. GLASTONBURY — Over the past decade Richard Allen, the senior minister at Congregational Church in South Glastonbury, has worked with what he calls his “Muslim neighbors” on everything from Habitat for Humanity to sharing worship experiences. The series, given by members of the Muslim Coalition of Connecticut, will be held on the first Monday in April, May and June. The talks are free and open to the public and are held at 7 p.m. at the church, at 949 Main St. in South Glastonbury. On Monday, the subject will be: “Understanding Islam and Muslims”; May 2 “Women in Islam”; and June 6 “Hot Button Issues Pertaining to Islam and Muslims.” The programs will be presented by Dr.Reza Mansoor, founding member of the Muslim Coalition, and Aida Mansoor, president of the coalition. The coalition was founded in 2004 by a group of local leaders to provide an alternative to the negative illustrations of Muslims. The organization focuses on educating the public on Islam and Muslims and building alliances with other faith communities. Marion Mayo, a founder of Hartford Area Habitat for Humanity, enjoys a serendipitous moment of happiness after reading the Granby Drummer article about the Habitat for Humanity home to be built in Granby, CT. Visiting Marion Mayo is always a joy! Yesterday, I called on Marion at her retirement community apartment to bring her the April 2016 edition of the Granby Drummer, the town's widely read local monthly. It featured an article about Hartford Area Habitat for Humanity's plan to build a home in Granby. The Granby Habitat home is extra special not only because Marion and her late husband Bob founded Hartford Area Habitat for Humanity 27 years ago in 1989, but especially because the home will be built less than a mile from their former home in the West Granby section of town. "Basically around the corner," as Marion put it. Thanks to Windsor Federal Savings' generous donation of the lot, the Granby home will be Hartford Habitat's first home built in a rural Hartford area town. Most of Hartford Habitat's 230 homes built to date have been constructed in Hartford, New Britain, East Hartford and Bloomfield. Bob and Marion are remembered and revered as long-time community leaders -- stonecatchers who served in many capacities and organizations in Granby and Hartford. The Granby Habitat home is a fitting celebration of their commitment to build better communities. To find out more about Hartford Area Habitat for Humanity visit its website . Saudi Arabia Uncovered offers an opportunity to watch and learn. It will be broadcast tonight on CPTV (Connecticut Public Television), and later online. The Frontline commentary below summarizes the documentary's focus. "[A] new Frontline documentary, Saudi Arabia Uncovered, goes inside the tightly-controlled kingdom to tell the stories of men and women who are risking everything to try to change their country, and challenge the powerful ruling regime." "With undercover footage and on-the-ground reporting, Frontline reveals a side of Saudi Arabia that's rarely seen, and traces the efforts of men and women who are working to bring about change." On CPTV: Tuesday, March 29 at 10:00 p.m.
“They’re desperate and have lost everything. They live in fear and are very grateful for what we do. Most are very spiritual and grateful to God.”— Paula Mann-Agnew, Catholic Charities’ director of programs. "Since the Syrian refugee crisis escalated last year, Catholic Charities of the Archdiocese of Hartford (CCAOH) has stood poised to help resettle families sent to Connecticut. Connecticut is one of the states that has volunteered to accept Syrian refugees" according to Wendy Healy's "Catholic Charities: all refugees welcome" article in The Catholic Transcript's March 2016 issue. Catholic Charities of the Archdiocese of Hartford is one of the principal gateway organizations for resettling refugees in Connecticut. Through its Migration, Refugee and Immigration Program Services, Catholic Charities "has a 60-year history of welcoming the stranger and those in need" via its Hartford office. As Healy's article emphasizes "Catholic Charities' efforts are only possible through partnerships, " and that "support has been robust from individuals, churches and the interfaith community." Through my involvement with Hartford's Asylum Hill Neighborhood Association's Welcoming Committee, I have come to know first hand the good work of Catholic Charities' staff and volunteers, some of whom are refugees who have successfully assimilated into greater Hartford. Last January I wrote about the New Year Celebration 2755 with the Karen refugees from Myanmar (Burma). Most in attendance were resettled in Hartford through the Catholic Charities program. I encourage you to read Healy's article to get the full picture of Catholic Charities' commitment to refugee and immigrant resettlement, and check out the Catholic Charities website to find out more about how to get involved. Ashon Avent is an enterprising stonecatcher. 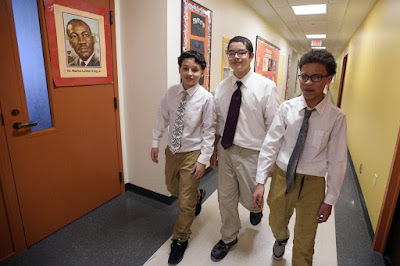 Hartford Courant reporter Vanessa De La Torre's excellent and inspiring article "Neckties Make The M.A.L.E.S." tells story of Avent's program to develop leadership skills in the young men at Hartford's M.D. Fox School. It's a must read. It starts with a tie. I am a big fan of the Harriet Beecher Stowe Center. It is one of my "go-to" advocacy organizations for its commitment to social justice and positive change. The April 21, 2016 Stowe Salon on Combatting Environmental Racism promises to be an excellent opportunity to listen to and talk directly with Hartford community leaders who are actively addressing environmental racism. Join the conversation with Rev. Kari Nicewander, Immanuel Congregational Church, Pastor Steve Camp, Faith Congregational Church and Sharon Lewis, Coalition for Environmental Justice. The Salon is on my schedule. I encourage you to put it on yours. "The Beast Side: Living and Dying While Black in America"
D. Watkins is an award-winning writer, educator, and speaker. He is the author of The Beast Side: Living and Dying While Black in America with its "searing dispatches from the urban zones where African American men have become an endangered species." "Watkins hailed from the streets of East Baltimore during the semi-automatic era. After years of being deeply involved with the crack game and losing family and friends to it, he took a long, hard, life-changing journey that lead Watkins to earn his MA in Education and MFA, become a college professor, and be a voice for millions through his guest appearances on the news and talk shows." 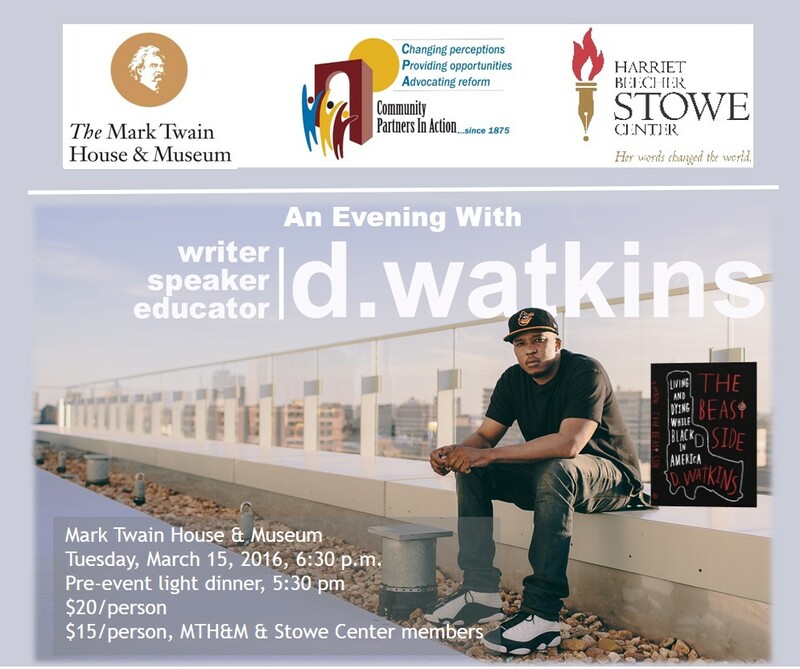 Watkins will be at the Mark Twain Museum Center Tuesday, March 15, 2016, for An Evening with D. Watkins The event is presented in collaboration by the Harriet Beecher Stowe Center, The Mark Twain House & Museum, and Community Partners in Action. John Dankosky of WNPR will moderate. I'll be there. I hope to see you there, too. "...a small act by a single student...is having a great impact..."
“We're sorry about everything that went down at the game last week,” said Farmington High School senior Danny Ha to students from Capital Prep whom he coincidently met at Hartford Stage's production of Romeo and Juliet. Apology Accepted, Hartford Courant reporter Lori Riley's continuing coverage of the derisive "SAT chant" captures the story of a chance meeting between a Farmington High student who seized the opportunity to apologize on behalf of the high school for the hurtful chant directed at Capital Prep's girls basketball team last week. Of the apology, Lisa Loomis, head of Capital Prep's English department, said, "It was a small act by a single student, but it is having a great impact on our school." It's a positive step. A step in the right direction. More steps need to be taken. The apology opens a path. Read Lori Riley's article Apology Accepted to get the full story. For further background read Turning a Hurt into a Positive, Riley's first article on the "SAT chant." "...they had to figure out how to tear us down..."
Stones. The words hit like stones. They hurt. They leave scars. At the end of the Capital Prep win, some Farmington fans chanted "SAT scores, SAT scores, SAT scores.” "I was hurt because I feel that just because we were able to beat Farmington, they had to figure out how to tear us down in some type of way," Desiree Elmore recounted. The words "SAT scores" were thrown mockingly at Capital Prep's girls basketball team by "some Farmington [High School] fans in the student section" during a game last Friday. 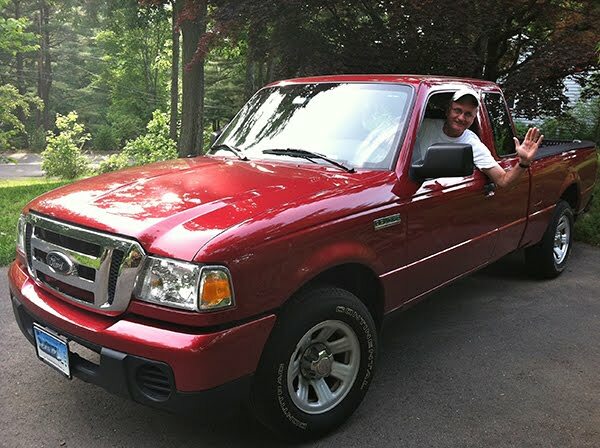 Turning a Hurt into a Positive, the Hartford Courant article by Lori Riley, tells the story. Capital Prep history teacher Lauren Davern "urged students to sign up for A Call to Action, and said they would discuss ideas on how to tackle this problem." Farmington High students would be smart to follow Capital Prep's lead. Watch the Courant's video about the Capital Prep student assembly on the "SAT scores" chant. Photographer Melanie Stengel's photo captures the spirit of the relationship Brother Marcus Turcotte had with the Boy Scouts of Hartford's Troop 5. His story is inspirational. He cleared a path toward a better life for young men of Hartford's Frog Hollow neighborhood. The full story is in Hartford Courant reporter Vinny Vella's story, Scouts' Honor. Brother Turcotte is a stonecatcher. "those stones -- what were they -- where did they come from"
"those stones what were they where did they come from," lines from Juan Felipe Herrera's poem, "You Throw a Stone", are questions we should ask every day. Herrera is the poet laureate of the United States. 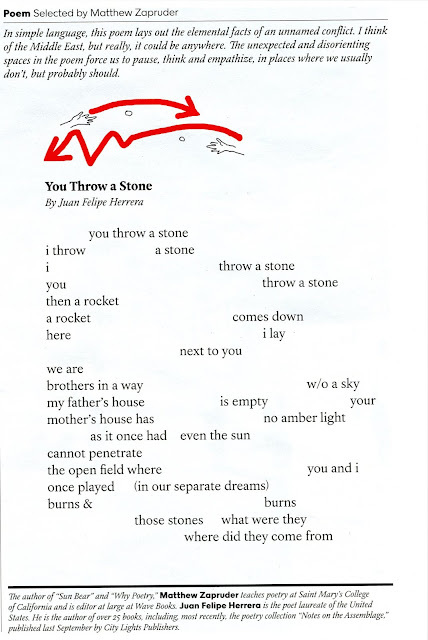 The poem appeared in the New York Times Magazine, March 6, 2016. In Sacramento, Muslims, Interfaith Groups, and Habitat for Humanity of Greater Sacramento, standing together against cultural and religious intolerance, announced on January 20, 2016, a Build for Unity national challenge. This Build for Unity video captures the essence of the challenge. Sacramento's Build for Unity project brings together members of the Muslim and interfaith communities to fund and build homes for two local families in need, and to make a stand of togetherness against cultural and religious intolerance. "Coming together as a community to build houses in order to provide a home for people that need a home – is the loudest statement that we can ever make to the rest of the country," said Imam Azeez, a local leader in the Muslim faith community. "The Build for Unity sends a most powerful message during a time when we need to elevate above the hateful rhetoric used by some in this country," said Congresswoman Matsui at the event launch. I learned about this Sacramento Habitat sponsored initiative while recently working with a team representing 14 Habitat for Humanity affiliates from across the country gathered to develop recommendations for expanding Habitat for Humanity International's interfaith collaborations globally. Sacramento's initiative builds on the interfaith collaborations several U.S. Habitat affiliates currently host. I know this to be true having led local interfaith initiatives with Hartford Area Habitat for Humanity. "Come together. Build together" is one of Hartford Habitat's core uniting themes to bring diverse groups together to work collaboratively building affordable homes for families in need. Hartford's Habitat has held interfaith builds for more than a decade, focusing initially on bringing the three Abrahamic faiths, Christianity, Judaism, and Islam, together to sponsor and build a home we called a "House of Abraham." In recent years the home has been call a "House of Faith" as we expanded the focus to encourage all faiths to participate. These builds also include off site events to promote conversation, friendship, and community. Interfaith collaborations are imperative initiatives that many organizations and institutions can sponsor in taking a stand of togetherness against cultural and religious intolerance. As a statewide nonprofit policy and advocacy organization the Partnership for Strong Communities offers exceptional programming on housing issues related to building strong, sustainable communities for all people across Connecticut's demographic spectrum. The Partnership "plays a vital role in shaping solutions to end homelessness, develop healthy neighborhoods and to create more affordable housing opportunities for workers, young professionals and families."